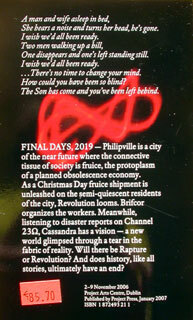 FINAL DAYS, 2019 — Philipville is a city of the near future where the connective tissue of society is fruice, the protoplasm of a planned obsolescence economy. As a Christmas Day fruice shipment is unleashed on the semi-quiescent residents of the city, Revolution looms. 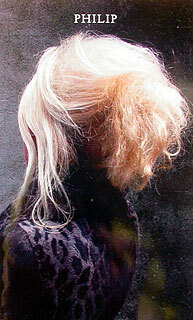 Brifcor organizes the workers. Meanwhile, listening to disaster reports on Channel 23Ω, Cassandra has a vision — a new world glimpsed through a tear in the fabric of reality. Will there be Rapture or Revolution? And does history, like all stories, ultimately have an end? PHILIP is a novel by Mark Aerial Waller, Heman Chong, Cosmin Costinas, Rosemary Heather, Francis McKee, David Reinfurt, Steve Rushton & Leif Magne Tangen conceived during a science fiction writing workshop at Project Arts Centre, Dublin, 2–9 November 2006 as part of an exhibition curated by Mai Abu ElDahab.